Duration: from 6 to 8 days tour. Route: Dalat – Lak Lake – Gia Nghia town(bolder town) – Dong Xoai town(bolder bell) – Ben Tre – Can Tho city – Saigon city. – Standard Hotels(clean and facility rooms). – Knowledgeable and experienced tour guide. – Saddle bags & raincoats, if needed. – Local coffee or Sugar can juice. This tour could be done from 2 to 4 days even more. It depends on your interest, time..
Day 1: Da Lat – Jun village ( Lak ): a small town with mostly M’Nong people. The place is wellknown with a biggest natural lake in the South of VN: Lak Lake. Arriving time: from 4pm to 5.30pm. Day 2: Lak – Gia Nghia: a small, new town near Cambodia’s border. Day 3: Gia Nghia – Dong Xoai: a small town in the west of HCM city.It was an American military base. Wood carving, “special bridge”, cashew farm, cashew factory and so on…Enjoy riding through amazing areas with uncredible beautiful landscapes along of Cambodia’s border, stop at some traces of the war, listening to war history and to history of the famous HCM trail. Day 4: Dong Xoai – Ben tre, part of Me Kong . wood plying factory, black smith, broken bridge, latex manufacturing, cemetary with unknown old tombs. Having lunch in a local restaurant..Peanut farm, Cao Dai Temple , coffee ( or fruits ) stop before arriving in BenTre. Day 5: BenTre - Can Tho, Central Me Kong where the famous floating market is. Making rope from coconut fibre, coconut oil and many more manufactoring from coconut. Khmer Buddhist Temple and Khmer culture are also very interesting to know. Fish breeding farm, rushes hat handmaking, old traditional houses restoring with lots of carving on hard woods. 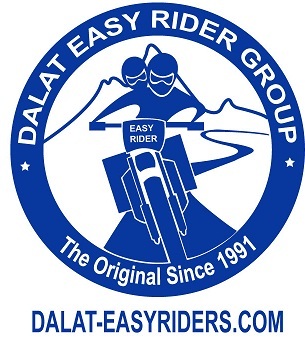 The Original Dalat Easy Rider Group enthusiastic and knowledgeable generation with years of experiences is so ready to help you connect with the real Vietnam, the bit forgotten by most Western tourists. We want to share with you the lives of the Vietnamese minority; to understand more about people, culture, cuisine and the hidden charm of the country.